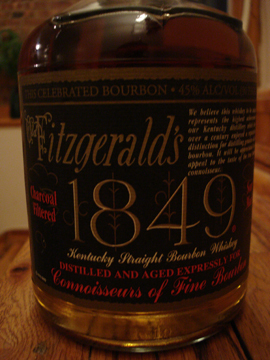 I worked in my family’s liquor store in the early 70’s where I first was introduced to Old Fitz 1849. As I recall at that time it was a little higher proof, 92.something or 94.something I forget which and it had a cork stopper. It even came in pint and 1/2 pint bottles the same shape as the fifths and also had a cork stopper. I believe at that time it was owned by the Stitzel Weller company. On the back of the label it had this written, “We make the finest bourbon at a profit if we can, at a loss if we must, but always the finest bourbon”. I thought that was a pretty cool thing to say. My recollection is that it was smoother back then almost like honey and it absorbed into the tongue. It is still quite good and at the price it is hard to beat, it is just hard to find. I have been able to special order it in my area as it is carried by a local distributor, but I never see it stocked on any shelves. I just hope that it is not old stock and will run out soon.